You can capture amazing video with all kinds of cameras these days, but almost all of them have really bad on-board microphones. 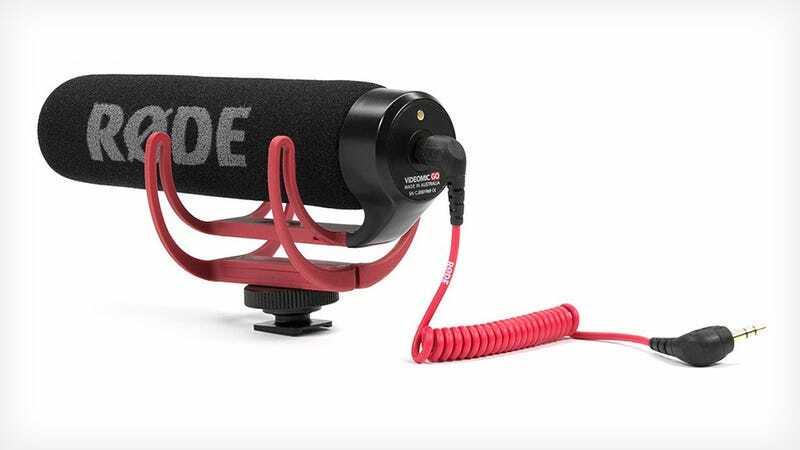 Rode's new simple-as-pie shotgun mic looks like an easy and cheap way to give your videos the clear sound they deserve. The Rode Videomic GO is $100 and aimed at video shooters who want a basic upgrade from the sonic mush you usually get from GoPros, mirrorless cameras, and DSLRs. The mic requires no battery and is light—like, REALLY light, at only 2.5 oz (73g). You will barely feel it mounted to you camera's hot-shoe. Another great feature is the suspension, the patented Rycote Lyre system, which minimizes bumps and vibrations that might otherwise come through in your recording. Over the last few years, Rode has really done well for videographers. Its Videomic line is a go-to solution for many. We use the Videomic PRO here at Gizmodo HQ, a more expensive and higher quality version of the Videomic GO. Don't expect this new cheaper model to capture quite as clear sound as pricier options, but it still seems like a simple, cost-effective option.